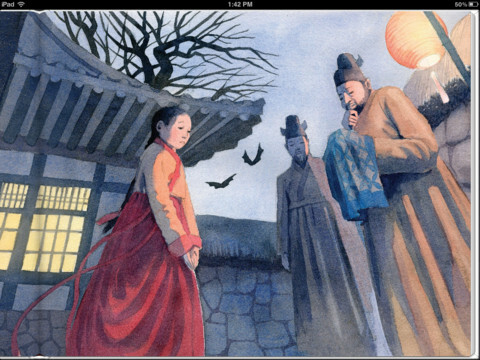 Good Fortune in a Wrapping Cloth by Joan Schoettler introduces young readers to ancient Korea through the story of Ji-su, a young girl who lives beyond the walls of the king's palace. Ji-su's mother is a seamstress and has been chosen to work in the palace to sew wrapping cloths (bojagi) for the king. Though this is an esteemed position, she must live away from her family. Ji-su commits to working tirelessly and practices under her aunt's guidance with the goal of showing her sewing skills to the Sanguiwon master so that she may be able to join her mother at the palace. This book is a wonderful introduction to ancient Korean culture, and it includes details such as traditions, customs, and depictions of everyday life in this part of the world. Good Fortune in a Wrapping Cloth is a nice supplement to world history studies, and it also includes a glossary of Korean vocabulary used in the story. "In autumn, Ji-su's girl cousins played on the swing. Once, she left her sewing to join them, hoping to see the trees on the other side of the wall instead of just the crowns of the trees like mushrooms peeking over the fence. Ji-su secretly promised herself to see what was beyond the wall someday. Gold and orange leaves danced in the wind, and Ji-su dreamed of the colors lining the path to Eomma." Good Fortune in a Wrapping Cloth was inspired by the author's experience seeing a collection of bojagi at an exhibit. The book includes background information on these cloths which were used widely during the Joseon Dynasty. Children enjoy learning more about this tradition and maybe even trying a small project of their own inspired by Ji-su's handiwork. Living books like these are a wonderful way excite children about the world around them, and this book does not disappoint.